Even though the sweat equity it takes is no walk-in-the-park, I am sharing nearly three decades of hard knocks, failures, successes, and wisdom as an Executive for a global multi-national and later an entrepreneur – and yes, it’s far easier to quit than to finish. 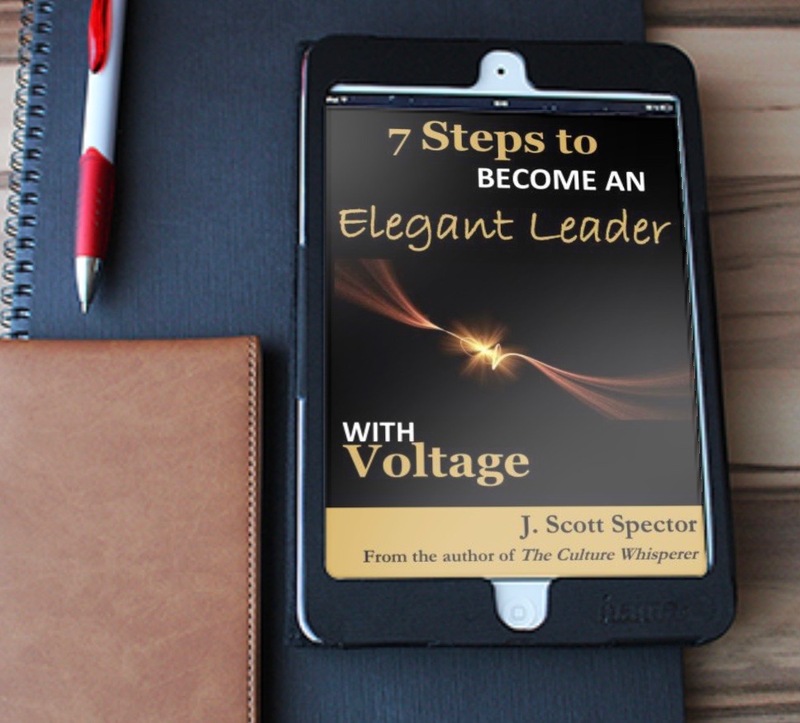 I’ve developed a proven system – The Elegant Leader with Voltage platform – a blueprint that takes you from a good to a great leader. When your ego takes a hit, when your results aren’t what you expected, when your relationships become stale or strained, or when you become overwhelmed by the sheer scope of the task, you’re going to be tempted give up – so, don’t. You can do this – and more quickly than you might think because these days you have access to more tools than ever. The key is to follow a proven in-the-field, step-by-step plan guaranteed, AND I will help you get through every step of the way. How can I make such a guarantee? I guarantee a lot when it comes to my accountability. Much of our relationship hinges on you – your level of commitment, desire, and determination to follow through, to take consistent action. I’m your stake-in-the-ground. When you follow the program, take it seriously and do the work, then it’s more than reasonable to expect to achieve what many others have achieved. I teach Executives and business professionals, like you, what works, why it works and how to implement the strategies and tactics immediately. Want to save this definitive guide to read later? Click here to download a handy PDF version. Don’t believe me? Try it FREE! 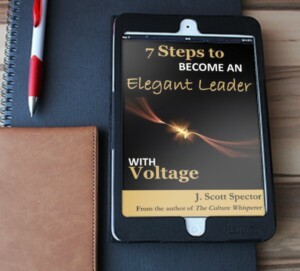 You will become unstuck, surpass your expectations and win as an Elegant Leader with Voltage. In it I show you how to overcome the 4 traps that hold you back and keep you overwhelmed and anxious without taking any more time out of your impossible schedule. That doesn’t have to stop you from becoming the best leader you can be. The 7 Steps to Become an Elegant Leader with Voltage are simple, practical and powerful. I’m giving you all 7 steps FREE today, because you think you’re so busy…”but Scott, you don’t understand my situation.” Sure I do! I’ve been there, more than once too; even when I was down to my last $4; when there was no hope, no prospects and I saw no way out. The truth? It starts with your priorities. We all make the time to do what we REALLY want to do. I didn’t say find the time. You won’t ever find the time. You make the time, to carve it into your schedule. The answers are in my proven in-the-field system. Want to save this definitive guide to read later? Click here to download a handy PDF version. In this eBook, I’ll show you how to overcome the obstacles and traps that have kept you from being the Leader you know exists within you. Then, I’ll show you the secret to eagerly coming back to your Blueprint every day to maintain clarity and stand your ground when not if it hits the fan. What if change and learning were more fun, useful and rewarding? What becomes possible if you were more energized instead of enduring the daily grind? It’s taken nearly three decades to develop a system that’s worked and been proven in small intimate companies of less than fifty people, it’s worked in process-driven global organizations of over 15,000 employees and it’s worked in the worse economy in history and in entrepreneurial environments that led to successful succession, exits, buy-outs and everywhere in between. It simply works! I cover the good and the bad, the failures and successes proven-in-the-field and in Board Rooms throughout hundreds of organizations and the Private Equity firms we’ve worked with. The goal is to give you everything I have – the knowledge, the techniques and proven principles that have returned 2-10X ROI for our client’s and company’s who committed and dedicated themselves to take consistent action. Do you want to know more? Email me here. How long can you tolerate the painful years of mediocrity? What do you think will happen if you don’t change anything? If failure wasn’t an option, what would you do now? 1. The Blueprint – Focus daily on what matters most with your personal Elegant Leaders Dashboard at your fingertips. It’s far easier to lead when things are going well. It’s about leading when things aren’t. – why Elegant Leadership is important to those you lead, what you can do daily to improve your leadership and how to continue to lead elegantly under stress. Stay grounded and maintain clarity on what matters most in your sphere of influence. 2. Get Comfortable Being Uncomfortable – Becoming an Elegant Leader with Voltage starts with the right mindset before you can address other extents. There are skills and tactics to be sure, however, without the proper mindsets, you’re done before you get started. Voltage is in the clarity and perspective you’ll gain as your foundation. There’s a logical sequence and without the proper Mindset, Skill and Tactics in that order or you’re sunk before you begin. 3. Develop an Elegant Strategy – Here’s how you leverage what your organization should do best and how to practically and powerfully implement the tactics to realize the vision you set forth which delivers Voltage. It’s all about the execution of your team. You’re responsible for the people who are responsible for the people who are responsible for the outcomes. Do you want to save this guide to read later? Click the image to download a handy PDF version. 4. Be Clear, Concise and Compelling – It’s all about communicating effectively, simply and powerfully. It’s one thing to speak authentically to the organization. Elegant Leaders with Voltage deliver an authentic, generous and transparent message always regardless of situation or circumstance. They don’t let the crisis of the day, control their output. 5. It’s All About Relationships – If you don’t understand people, then you don’t understand business, and Elegant Leaders have great relationships that carry Voltage. Internal and external relationships are high-value components once you understand the process to recognize, reinforce and replicate great relationships. 6. Moving Forward – Rhythm, balance and everything in perspective. Egos, relationships and results take rhythm – it’s what it takes for organizations move forward. Empathy and perspective are two critical components of the Elegant Leader’s portfolio. How you develop the team and the employees are fundamental to your success as an Elegant Leader with Voltage. 7. Problem Solving Capacity – Improve decision making by accurately evaluating situations with the capacity for decision-making expertise, judgment, problem-solving, and openness to new experiences and practical intelligence. There’s Voltage in how you expand your solution capacity and your agility in a practical, effective an elegant manner. 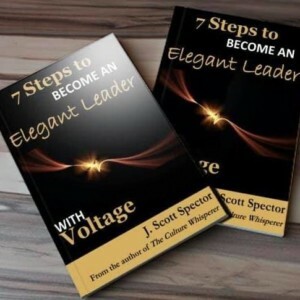 Now that you have the 7 Steps, you need to know what to do with them and how to implement them to Become an Elegant Leader with Voltage. The streets are littered with former business people and retired executives masquerading as mentors and coaches without any formal Executive coach training. I’ve been mentored by some of the best CEO’s in the US and have studied under the best coaches in the world. One insight I’ll share is “check the fruit on the tree.” It doesn’t have to be me to help you, but look for someone who is highly-regarded and sought after who knows the practical applications of Elegant Leadership and how to work with people through every level of an organization regardless of size or scale. 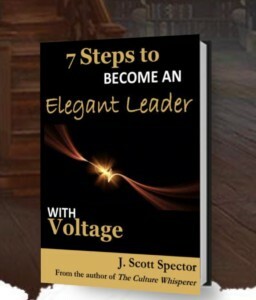 then leaning into the Elegant Leader with Voltage community is your next best step. We’ve all been there when we’re riding the crest of the wave of great success and suddenly our egos take an unexpected hit. We’ve had quarter’s even years when our results weren’t what we expected, what we wanted. And, on top of it all, somehow our personal and professional relationships became indifferent and lacking as well. It’s far easier to quit than to finish. Click here to download the definitive guide to read later.